Cidermaker Thatchers, based just outside Bristol, is introducing two new canned ciders as part of a relaunch of its traditional craft cider range. 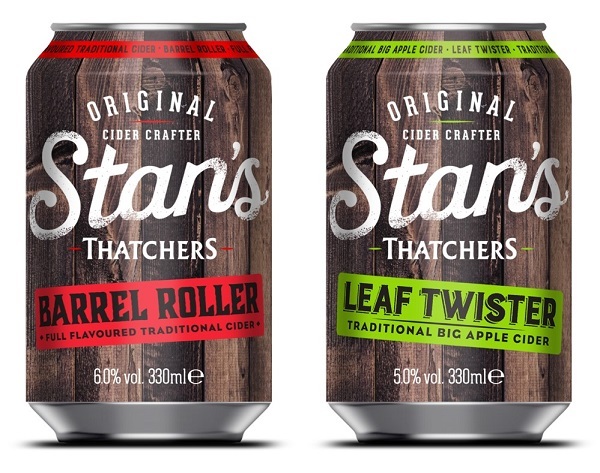 The range, which includes cans, bag-in-box, and draught ciders, has been given the name Stan’s, in honour of their second generation cidermaker, Stan Thatcher. Two new, gently sparkling ciders, packaged in 330ml cans, are named Leaf Twister and Barrel Roller – and we think the branding looks fantastic! Stan was Martin Thatcher’s grandfather, grew up on Myrtle Farm in Somerset (still home to the cider company today), and was a true artisan cidermaker. But what he loved most was sharing a pint or two of his lovingly crafted cider with his friends and customers in his cider shop. Martin Thatcher, fourth generation cidermaker says, “I’m sure my Grandfather would be very proud to have his name on this range. He was a true artisan cidermaker and many of the skills and traditions we still hold dear today originated with him.